One of the difficult aspects of discovering that one has celiac disease or is intolerant to gluten is dealing with the sudden disappearance from the menu of a whole lot of types of food – no more bread, pastry, cakes, muesli – that most of us take for granted as part of life. What can be a surprise is the difficulty of finding a substitute for a favourite breakfast cereal. Clearly things made from wheat, oats, rye and barley are off the menu, but the nasty surprise is that so many cereals that don’t appear to be made from these ingredients contain gluten in one guise or another. Things like glucose syrup – often made from corn, but might equally be made from wheat, sometimes changing from one month to another depending on which source is cheaper at the time. Or caramel flavour – yep, often made from one of the gluten-containing grains. Maltose – barley. And on and on. The nice thing nowadays is that a very significant market in gluten-free grain products has developed to meet the need, unlike even ten years ago when there was little available. The ordinary supermarkets have some products from which we can make muesli, but it is a limited range, and often quite expensive, and supply can be uncertain, apparently depending on whether the shelf-space is wanted for some higher-profit line. The ready-made gluten-free cereals are one of these higher-profit lines, often being ridiculously expensive. They are of course “delicious”, probably mostly because of the sugar and salt they contain. Health-food stores are another source of gluten-free grains and ready-made gluten-free muesli, but if you thought the supermarkets were expensive you’re in for some serious sticker-shock in most health food outlets. I’ve long ago given up shopping there. In Southeast Queensland we are lucky in that over the last few years Wrays# organic food outlets have been multiplying rapidly. These franchises are committed to providing organic food at realistic prices – just as one example, we often buy very good organic potato varieties from Wrays cheaper than the no-name potatoes in our local Coles. Wrays have a wide range of gluten-free products, including many potential muesli ingredients. I found initially that if I just added one ingredient after another to a large mixing bowl, it was difficult to duplicate the proportions when I found a mix that we liked and wanted to make it again. 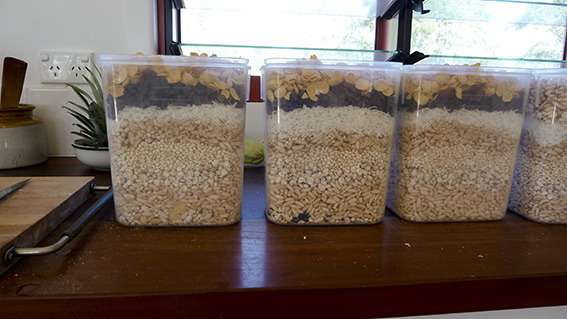 Then I hit on the idea of making it up in several two-litre clear plastic bins as in the photo above, so that the proportion of one ingredient to another was obvious from the visible layers. Then it wasn’t too hard to more or less match the mix next time from memory. Once the bins are full I pour them one at a time into a large bowl and mix thoroughly (by hand, it’s too loose to mix with a spoon) before pouring them back into the bin. Be warned that this mix is pretty boring without the addition of the dried fruit, nuts, and/or fresh fruit, milk, yoghurt, honey. But with them it’s as good as any commercial gluten-free muesli in my opinion, and you’ve been able to control the proportions of ingredients and the amount of sugar and salt in it. You can also make a “porridge” from this mix by putting equal amounts of mix and milk into a saucepan and heating. It’s an acquired taste. Good luck with your muesli experiments. # my mentioning a brand or business does not constitute a recommendation, or a guarantee that the items do not contain gluten or are more suitable than an alternative brand. As with all ingredients for a gluten-free diet, you will have to check the packaging, contents list, prices, etc. and make your own decisions. These are the items that I use, and I am not aware of having experienced any adverse effects from eating these products. Businesses selling these products are mentioned only because I know that the products are regularly available there in the Lockyer Region area (including Toowoomba). I may be willing to mention other locations where these products are available provided prices are comparable to the locations listed here. ** be aware that many dried fruits contain preservatives such as sulphur dioxide. I know that there’s no obvious connection between gluten-free cooking and sustainability, but I think that the more we can take charge of our own health and diet, the more sustainable our lives, and society generally, will be. We have had to develop our own collection of recipes, and frequently to invent recipes that suited our diets. This gluten-free corn bread recipe is also egg-free and dairy-free, and if the yeast is replaced with baking powder it can be yeast-free too. 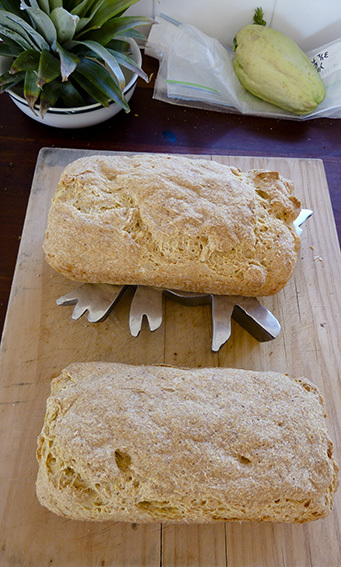 Some people at a workshop on simple living I attended last weekend asked me for this recipe, so I thought maybe I’d start an irregular feature of gluten-free food posts. This first recipe can be found here. Good luck with it. The two-day workshop was organised by the Citizens of the Lockyer with funding from the Lockyer Valley Regional Council, and run by Rhonda Hetzel from Down to Earth blog. Rhonda is an inspiring speaker and generated a real buzz in the group, with lots of discussion and sharing of experiences and ideas.